There is a story, potentially an urban myth but certainly worth repeating, of a slight cultural misunderstanding that happened one Christmas back in the 1980's. The alleged incident occurred at the now defunct Sogo department store in Yurakucho, downtown Tokyo. Deciding to adopt the festive spirit, they created a display of traditional Christmas characters with the centre piece being Santa, firmly nailed to the cross. Points for trying I suppose. This being early September, the next holiday event will be Silver Week in the third week of the month when two national holidays fall a single day apart and, as a result, the intervening day is also given, by law, as a holiday. After that it is Halloween, which in recent years has been adopted with gusto by the student youth of Japan. Head down to Shibuya crossing if you can. Quite a sight if you happen to be in Tokyo at that time of year. The one thing though that is not supposed to be seen in September, is Santa and his sleigh. 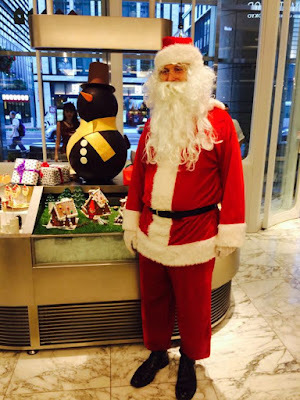 And on 2nd September, The Mandarin Oriental set a new record for the earliest known introduction of what can only be described as a very sheepish looking Father Christmas, clearly still working on building up his winter body-fat reserves for the feverish night's work to come. Just hope the reindeer don't get too jealous of Olaf, or Santa is in for a rough ride. Uhh, Happy Christmas! I think.